The Priory of St. Michael New England has been working and making slow advances toward a quest. 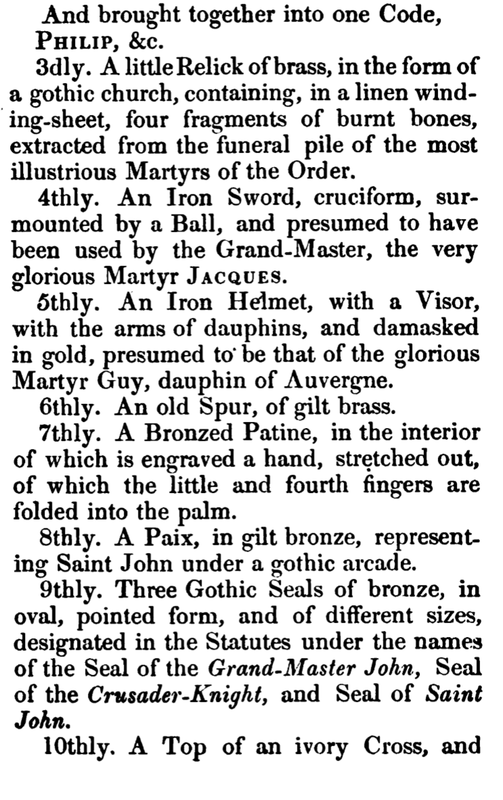 Things have lulled as of late, so I invite you to aid us in this quest for the Relics of Jacques DeMolay. Allow me to explain. The OSMTJ is descended from a public revival of the Order back in 1804 by Bernard Raymond Fabre-Palaprat. 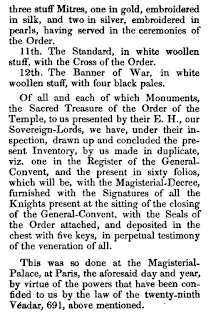 The Order was brought back into the public with much fanfare. 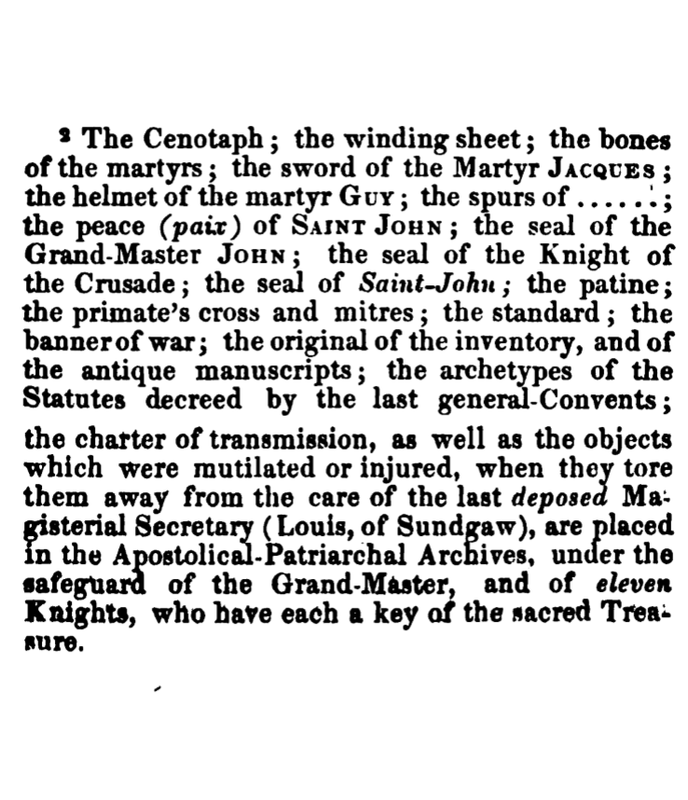 By about 1815 they had published the Manual of the Order, which gives us the first clues as to the whereabouts of the Relics. 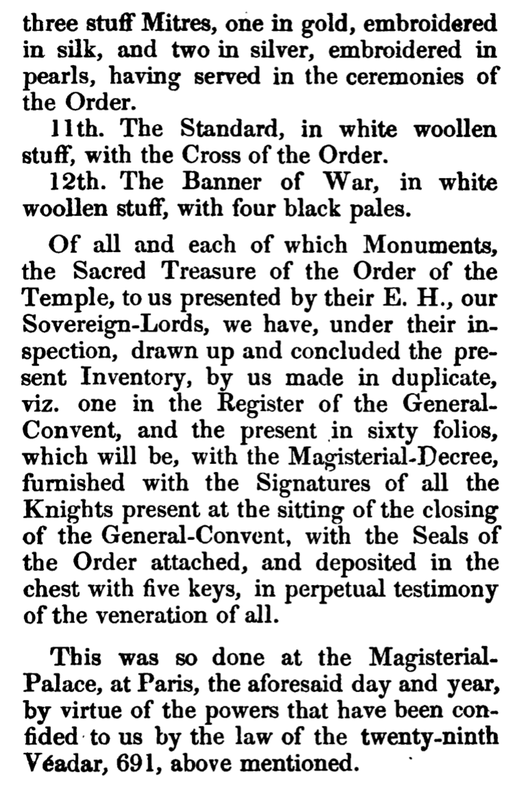 In the book, they relate the Inventory of the Templar Treasury which was put on display and sworn with the signature of 200 Knights. 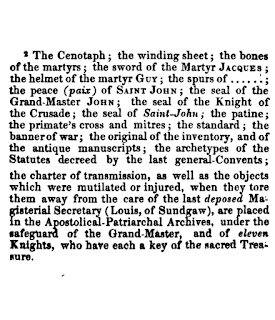 However, even during the creation of the book, the situation changed and the Treasure was moved from a Chest with Five Keys in the Magisterial Palace in Paris to a Chest with Eleven Keys in the Apostolical-Patriarchal Archives, under the supervision of the Grandmaster. After this, the record is silent for quite some time. 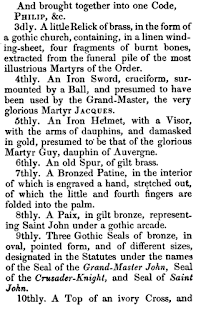 However, it is recorded in OSMTH history that Regent A.G.M Vernois deposited certain documents and items in the French Imperial Archives in 1870. At this point, progress has slowed. The National Archives do have an online inventory that is searchable. However, research requests are not carried through their posted email. If you are interested in trying to track down information about this, please do. I have searched for things like "Ordre du Temple", "Vernois", etc, with little fruit. Not to mention, documents that are found are in French. Feel free to call them if you have a long distance plan. If you can make a research request, try it. Anyone who wishes to aid in the quest is welcome. Any original research is also welcome. SSGT Daniel Clausen, Priory of St. Michael New England.